6.1 How do I write the Linux image to a micro SD card to use with my A10 board? 6.2 How to generate boot-able SD-card Debian Linux image for A10-OLinuXino-LIME? 6.3 How to connect a display and adjust the video output resolution? 6.4 How to download new Android image to the NAND memory of my A10 board? 6.5 How do I write the official Android image to a micro SD card for my A10 board? 6.6 How to detect and enable the Ethernet controller (if it is disabled by default)? 6.7 How to generate Arch Linux image? 6.8 How to edit board configurations and definitions in the official Debian Linux? The official Debian images are suitable only for microSD card. Information on booting Debian from the NAND might be found at the forum. Download methods and locations might be found below! there is a simple test for SPI2 in /opt/spidev directory. Note: the A10-Debian card which we have in our web store contains the same image on 4GB Class10 fast micro SDcard, if you want to use this image please use card of Class10 speed or the performance of Linux will be very slow. Note: in the previous Debian releases the Ethernet was auto-detected and initialized during boot BUT this was causing big delays in the start-up of the board if you didn't want to use Ethernet or if there wasn't Ethernet cable connected. 1. To check under what name the LAN is associated write "ifconfig –a"
2. If, for example, it is under eth0 name, then write: "dhclient eth0"
This should enable the Ethernet and then SSH would also be available. Torrents of official Android releases are below. Please read description of the image carefully. Direct download locations of official Android releases are below. In case the daily limit of the download locations had been reached, please use the torrents above. Please read description of the image carefully. The power jack is standard OLIMEX Power jack. Comparison table of power consumption might be found at the following link. 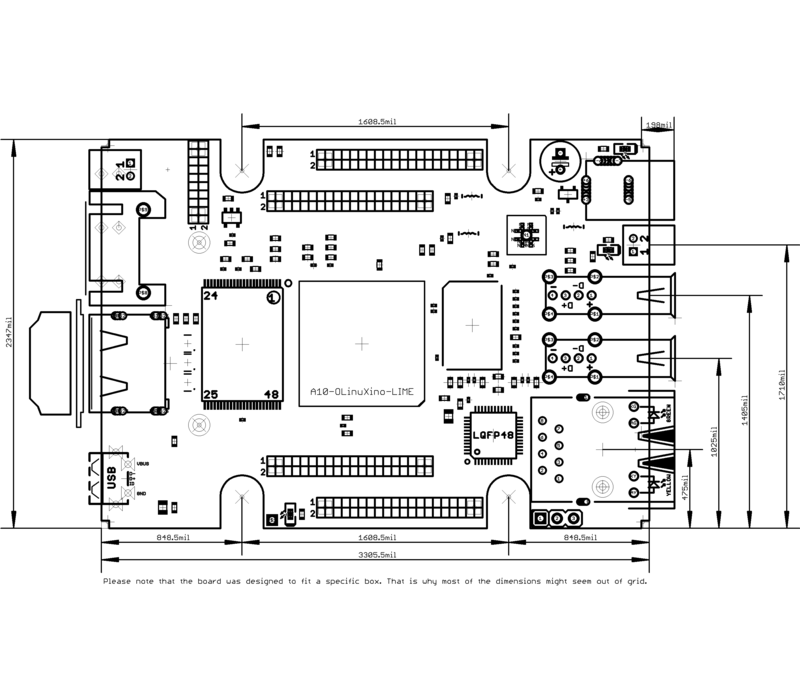 The CAD product used to design OLinuXino is Eagle and you can download evaluation free version from their web. How do I write the Linux image to a micro SD card to use with my A10 board? where X is the uSD card. How to generate boot-able SD-card Debian Linux image for A10-OLinuXino-LIME? Sunxi u-boot loader The linux-sunxi git page contains a lot of sources for all Olimex Allwinner boards. How to connect a display and adjust the video output resolution? How to download new Android image to the NAND memory of my A10 board? Note that we no longer load Android to the NAND memory of the 4GB version of the LIME boards. You can upload Android following the advice below. There might be newer versions available. LiveSuit is used to send the official Android images to the NAND flash memory of the board. To activate the A10 bootloader do as follows: run LiveSuit; disconnect the power supply and USB cable from the LIME board; then press and hold down the RECOVERY button; apply power supply; attach USB cable; release the RECOVERY button; install the drivers for the new device discovered by your PC - manually point to the folder where LiveSuit got installed. After the driver installation Livesuit will detect the bootloader and will ask which file to program to the NAND flash. If there seems to be a problem at some point of the installation, start over. Note that it is not recommended to have your mini USB connected to an external USB hub. This might cause delays and might distort the signal levels. Always test with the USB connected straight to the USB ports of your computer. How do I write the official Android image to a micro SD card for my A10 board? • Disconnect the power supply and USB cable from the A10 board. Put an SD card in micro SD holder. We recommend 4GB class 10 card. • Press and hold RECOVERY button, apply power supply (6-16)V, release RECOVERY button. • Connect USB cable to the mini USB connector. • You will be asked for drivers for the boot-loader. Navigate to the folder where you extracted the PhoenixSuit and install the drivers from the respective executable (or manually point the installer to the drivers folder in the PhoenixSuit installation path). • PhoenixSuit will detect the board and would ask for the method of writing the image. Choose method of writing the image and confirm your wish to write the image. Important: When Android runs for very first time it takes several minutes to initialize all files and buffers please do not cut the power supply during this process! Also when fresh image is installed fast boot may be disabled, which means that when you apply power supply after few seconds Android will go in sleep mode and you have to press POWER button to start it, you can change to fast boot when you power off there is dialog box asking you if you want next boot to be fast boot, you have to check this box before you power off. Also note that you must do touch screen calibration when you run Android for very first time which might require a mouse. How to detect and enable the Ethernet controller (if it is disabled by default)? How to generate Arch Linux image? How to edit board configurations and definitions in the official Debian Linux? Do you want a custom video resolution output? Do you need a different port definition? Do you need to change the hardware defitions of the board? You would need to edit the board's script.bin/script.fex file. How to do it is described in another separate article: How_to_edit_board_configurations_and_definitions_in_the_official_Debian_Linux. This page was last modified on 25 October 2018, at 06:43. This page has been accessed 312,088 times.